Hernandez-Pinto, A.M.; Gomez-Vicente, V. and de la Rosa, E. J. Proinsulin: A putative novel therapy for retinal degenerations. Ivanova O.N., Drozhzhina G.I Soft contact lenses as a basis for the cultivation of the fetal fibroblasts. Dorota Muszynska, Dr David Simpson, Mr Colin Willoughby The genetic basis of keratoconus (KTCN) can be determined with gene expression profiling. 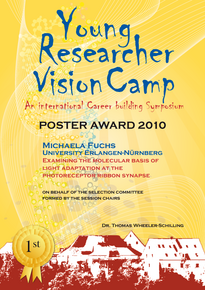 Daniel L. Rathbun, Thomas Euler Toward a MEA-based assay of retinal function in the mouse. T.A. Kamalden, A. Bron & N.N. Osborne Rotenone is similar but not identical to light-induced apoptosis in RGC-5 cells, and is attenuated by two green tea flavonoids. Anna Wawrocka, Maciej R. Krawczy?ski Searching for mutations in OPA1 gene in Polish patients with Autosomal Dominat Optic Atrophy. Zhijian Zhao, Frank Müller Modulation of cGMP synthesis in the mouse retina by endogenously released and by exogenously applied nitric oxide. 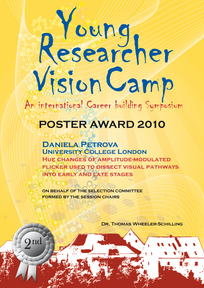 The deadline for the submission of the abstracts of the Young Researcher Vision Camp was May, 15th.